David Hyde Pierce as Cecil Terwilliger and "Man in crowd"
The living room is on the ceiling. The Simpsons sit down, but fall to the "floor" (the ceiling). "Brother from Another Series" is the sixteenth episode of The Simpsons' eighth season. It originally aired on the Fox network in the United States on February 23, 1997. 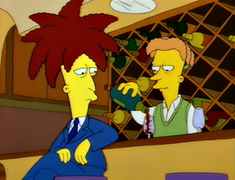 Sideshow Bob is released from prison into the care of his brother Cecil and claims to be a changed man. However, Bart does not believe him and tries to find out what Bob is up to. It was the first episode directed by Pete Michels and was written by Ken Keeler. The episode guest stars Kelsey Grammer in his sixth appearance as Sideshow Bob and David Hyde Pierce as Cecil. The title is not only a pun on the movie The Brother from Another Planet (used for a previous episode as well), but also a reference to the fact that guest stars Kelsey Grammer and David Hyde Pierce also played bickering brothers Frasier Crane and Niles Crane, respectively, on the NBC sitcom Frasier. Former criminal Sideshow Bob is declared a changed man by Reverend Lovejoy and released from prison on a work program, despite the protests of Bart. Bob is surprised to be taken into the care of his brother Cecil as the two had previously not spoken for ten years. Cecil, who is Springfield's chief hydrological and hydrodynamical engineer, employs Bob to supervise the construction of a hydroelectric dam in a river near the town, while Bart, believing Bob is still evil, continuously follows him around. Bob gets annoyed by Bart's intrusions and the dam's incompetent laborers (Cletus and his family) and expresses a desire to see the dam burst and obliterate Springfield. Bart enlists Lisa to help find out what Bob is up to, but he finds them rummaging in his trash and angrily escorts them home. While searching Bob's trailer at the dam construction site, Bart and Lisa discover a briefcase full of cash. When Bob catches them, the children run and hide inside the dam's turbine room, but are cornered. When confronted with the money, Bob denies knowing about it, stating he put up his finances to put concrete in the dam's walls, but discovers the walls to be empty and poorly constructed. Cecil shows up with a gun and reveals he embezzled the money; and plans on framing Bob, using him as a scapegoat when the dam collapses. He claims his motivation for the crime was Bob being chosen as Krusty's sidekick instead of him, which estranged the brothers. Cecil locks Bob, Bart and Lisa in the dam and prepares to blow it up, taking the money with him. Deciding to work together, Bart, Lisa, and Bob escape and try to save the dam. While Lisa and Bob defuse Cecil's dynamite, Bart jumps at Cecil before he can press the plunger. Cecil attempts to swat him off with the briefcase of money, which breaks open and the money is lost. Cecil throws Bart off the cliff, but Bob grabs the cord of the dynamite and dives down to save him. As the two dangle down the side of the dam, Bob cuts the cord on the dynamite to prevent Cecil from destroying the town, but a pipe stops his and Bart's fall. The police arrive and Cecil is arrested. Bob gloats over his victory, having gained the respect from Bart and Lisa, but Chief Wiggum arrests Bob, believing him to be involved in the plot as well, despite Bart and Lisa's protests. As they are taken away, Bob is tricked into swearing revenge and incriminating himself, by Cecil. The dam then crumbles and releases a torrent of water on Springfield, but only does minimal damage. In prison, the brothers share a cell and bicker childishly, as Bob is still angry at Cecil for making Bart his nemesis again. The episode was written by Ken Keeler, who had been watching a lot of Frasier at the time and had been assigned to write a Sideshow Bob episode and he thought it would be a good idea to mix the two. Pierce was cast as Sideshow Bob's brother, causing Pierce to joke, "Normally, I would not do something like this. But how often do you get a chance to work with an actor like Kelsey Grammer and, more importantly, play his brother?" While Sideshow Bob is addressing the crowd, a man near the back raises his hand and says "probably"; he is also voiced by David Hyde Pierce, who had wanted to be a man in a crowd. An early draft of the episode originally featured an Opera house explosion, which was changed because the writers felt using a dam would be more exciting. An early rule of Sideshow Bob episodes was to recap what had gone on in previous Bob episodes, in case the viewer had forgotten who he was. The original script was run by the Frasier producers to make sure they were okay with it, and they only had one problem. There was a very brief scene in which Cecil talks to a visible character and refers to her as "Maris", who in Frasier is an unseen character, and the producers of Frasier said the scene should go. The writers spent a long time trying to figure out a civilization that considered chief hydrological engineer a true calling and chose the Cappadocians, who were famous for underground cities although not specifically dams. Cecil was drawn to resemble David Hyde Pierce, but still look similar to Bob. According to director Pete Michels, it was difficult to draw Bob and Cecil standing together because their feet are both so big. There was a scene featuring Hans Moleman and his house, which was cut, but his house can still briefly be seen in the scene where Cecil throws Bart off a cliff. The sequence was cut in order to make room for the explanation of why Bob was sent back to prison. Ken Keeler has said that it is his favorite deleted scene. The Frasier-style title card which featured in the episode. The "Krusty the Clown Prison Special" is based on Johnny Cash's 1968 appearance at Folsom Prison. Krusty's song is a parody of "Folsom Prison Blues". The mention of Arthur Fiedler's wake is an apparent reference and parody of Frasier Crane's upper class Seattle lifestyle. The episode contains several references to Frasier, with the intention of making it obvious that The Simpsons was parodying the series. These include a title card just before the start of the second act which says "Frasier is a hit show on the NBC television network" in a similar typeface and style as Frasier's intertitles, with jazz music playing over it as it does in the series. When Bart jumps on Cecil and says "guess who", Cecil replies with "Maris?" Cecil's inability to see Bart also refers to the fact that Maris, Niles' wife in Frasier, is never actually seen. In its original broadcast, "Brother from Another Series" finished 39th in ratings for the week of February 17–23, 1997, with a Nielsen rating of 9.1, equivalent to approximately 8.8 million viewing households. It was the fourth highest-rated show on the Fox network that week, following The X-Files, King of the Hill and Melrose Place. Beforehand, the media said the episode "looks promising", and afterwards journalist Ben Rayner called it one of director Peter Michels' "classics". This episode was nominated for a Primetime Emmy Award for Sound Mixing for a Comedy Series or Special. In a 2008 article, Entertainment Weekly named Pierce's role as Cecil as one of the sixteen best guest appearances on The Simpsons. Grammer and Pierce were ranked second on AOL's list of their favorite 25 Simpsons guest stars. ^ Martyn, Warren; Adrian Wood (2000). I Can't Believe It's a Bigger and Better Updated Unofficial Simpsons Guide. Virgin Books. ISBN 0-7535-0495-2. ^ Groening, Matt (1997). Richmond, Ray; Coffman, Antonia, eds. The Simpsons: A Complete Guide to Our Favorite Family (1st ed.). New York: HarperPerennial. p. 173. ISBN 978-0-06-095252-5. LCCN 98141857. OCLC 37796735. OL 433519M. .
^ a b c d Keeler, Ken (2006). The Simpsons season 8 DVD commentary for the episode "Brother from Another Series" (DVD). 20th Century Fox. ^ "TV Tidbits". The Hamilton Spectator. 1997-02-20. ^ a b c d e f g Weinstein, Josh (2006). The Simpsons season 8 DVD commentary for the episode "Brother from Another Series" (DVD). 20th Century Fox. ^ a b Michels, Pete (2006). The Simpsons season 8 DVD commentary for the episode "Brother from Another Series" (DVD). 20th Century Fox. ^ Grammer, Kelsey (2006). The Simpsons season 8 DVD commentary for the episode "Brother from Another Series" (DVD). 20th Century Fox. ^ Associated Press (February 27, 1997). "Movies lift NBC to big ratings win". Sun-Sentinel. p. 4E. ^ "Volcanic thriller among Sunday watchables", Edmonton Journal, February 23, 1997, p. D.2. ^ Rayner, Ben, "Fans react to Family feud; FOXy The Family Guy pinches plots but also steals The Simpsons' thunder, to some fans' dismay", Toronto Star, November 5, 2006, p. C.6. ^ Associated Press, "49th Annual Primetime Emmy Nominations", The Globe and Mail, July 25, 1997, p. C.9. ^ Potts, Kimberly. "Favorite 'Simpsons' Guest Stars". AOL. Retrieved 2008-11-24. Wikiquote has quotations related to: "Brother from Another Series"
"Brother from Another Series episode capsule". The Simpsons Archive. "El Viaje Misterioso de Nuestro Jomer (The Mysterious Voyage of Homer)"
"The Secret War of Lisa Simpson"